The current state of the economy has resulted in a decreased number of a lot of things, one of which being inventory homes. A contributing factor to the slump in the housing market was the incredible surplus of inventory homes available on the market, but the housing market has been heating up lately and this inventory has become absorbed more and more with every passing month. While this is good news for the economy, it puts home buyers at a disadvantage if they were looking for quick delivery. Especially in the custom home market, a spec home is almost like a mythical being. 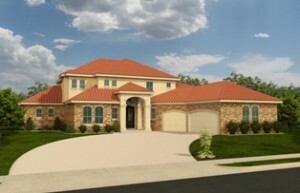 Austin custom home builder), the home is actually situated on a golf-front lot in the community. This plan has been modified from one of Sterling Custom Homes’ favorite custom plans. The layout really flows nicely to create the feel of a much larger home. One of the most popular design features in this home is the second bedroom, which is a guest bedroom on the main floor. It’s like having a guest casita inside the home, giving home owners the flexibility to use the space for guests or as an additional bedroom for the family. Flintrock Falls and Sterling Custom Homes. For more information, call 512-263-2214.